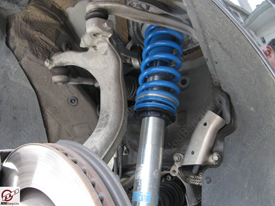 Upgrading your car's suspension can be one of the most rewarding modifications for the driver. Companies like Bilstein have taken their worldwide racing dominance experience and applied it to developing the ultimate automotive suspension systems. Their superior monotube gas shocks will give your Audi an incredible handling edge. With these coilovers, your car will literally feel like it is literally glued to the ground on the corners and your Audi's handling will be drastically improved! These coilovers will allow you to adjust ride stiffness and height for the perfect suspension setting! This "race inspired" system provides the ultimate in high performance tuning. The manually adjustable damping monotube gas shock absorbers feature a 9-stage precise compression and rebound settings, from comfort to competition. The threaded body allows accurate adjustability of the front and rear progressive rate springs to achieve the vehicle ride height, center of gravity and level of performance handling desired. From a weekend of competition to daily driving, this system provides perfect handling performance for every situation. Since the coil-over is height adjustable, this allows you to choose exactly how low you want your car to sit. The Bilstein B16 system puts you in complete control, providing the kind of precise suspension tuning formerly available only on race cars. From a weekend of track use, to daily driving, this system provides perfect handling when you want it. Patented digressive piston head design and deflective valving instantly reacts to changing road conditions. Monotube design dissipates heat more effectively than a twin tube shock for cooler, more efficient operation and longer life. Lighter weight reduces wear and tear on suspension components. *Through extensive research and development, Stasis Engineering has tailored the spring rates and valving to suit each vehicle, providing superior handling and better than OE ride quality. As always, Bilstein manufactures all of their suspension products to the highest standards. Bilstein continues to be the leader in monotube gas pressure shock absorber technology. 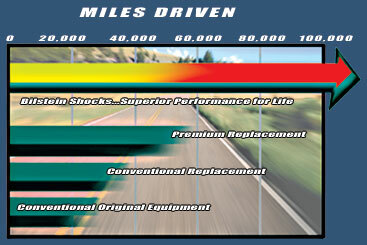 No other shock manufacturer has been able to equal the performance and enhanced ride characteristics of Bilstein. 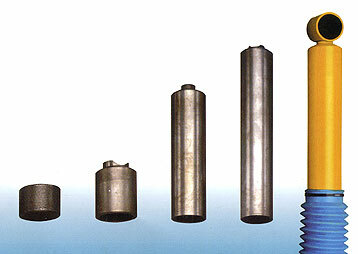 The tube of a Bilstein Gas Pressure Shock Absorber is fabricated using a special extrusion method. This process achieves an extremely tight peak-to-valley tolerance and maintains consistent wall thickness. 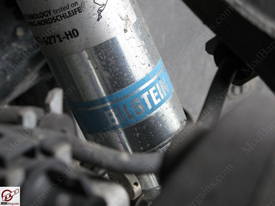 Bilstein's seamless monotube design provides superior tube strength while maximizing heat dissipation and shock life. Model Year Note Kit Part No. I absolutely love these coilovers. Getting them was the best thing that has happened to the car. They are fully adjustable when they are ON the car so you don't have to worry too much. To adjust, all you need to do is jack up each corner of the car really quick to relieve pressure off of the shock and adjust. There's nothing i don't like about these coilovers. At the softest settings, they feel just like the stock sport suspension and when its at the stiffest, it rides like a go-kart. ThyssenKrupp Bilstein of America warrants its gas pressure shock absorbers against defects in workmanship and materials for as long as you, the original purchaser, own your car. If at any time after purchase or installation, the shock malfunctions and Bilstein determines it to be defective, we will either replace it or repair it. original equipment shock absorbers - which are warrantied by the original equipment manufacturer. use on modified or other than Bilstein-recommended vehicles. Bilstein's liability for a defective shock absorber is limited to replacement of shock with a new or reconditioned Bilstein shock absorber. Rubber mounting hardware and labor charges are not covered by the warranty. Note: Other exclusions may or may not apply in certain states or rare circumstances. Proof of purchase is required to process warranty.